We photographed a summer camp wedding. Kamp Weddings are officially summer camp wedding photographers! This was the exact type of wedding we based our business around and it couldn't have been a celebration of 2 more special people. Kari and Colin have been together for like a decade and this was the laid back, fun-centered wedding they deserved to start this next chapter. Kari's brother Jeremy is one of my oldest friends and this family is so very special to me, so even though we already booked a wedding the night before in NJ, there was no way we were missing this! 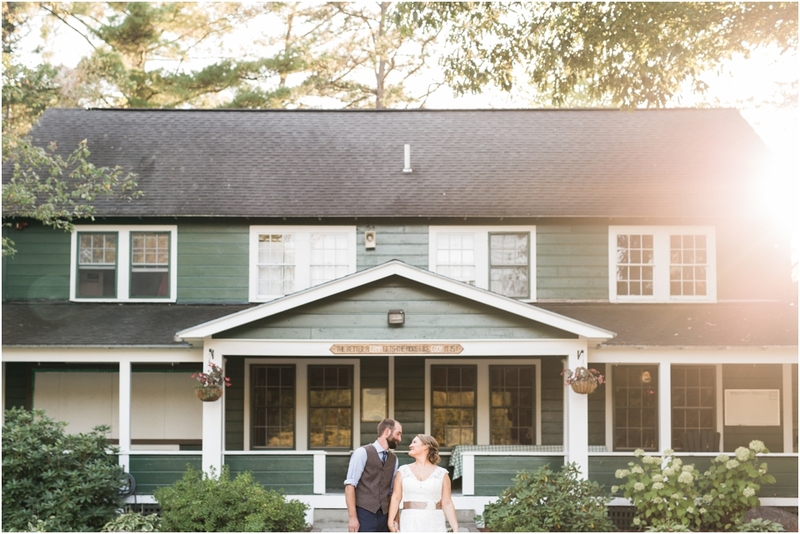 Camp Cody was such an incredible place to host your wedding, not just for the day, but for the whole weekend! 3 whole days of hanging out with loved ones, swimming in the gorgeous lake, sleeping in cabins and basically acting like you're 12 again. Kari got ready in the Long House, sipping mimosas and hanging out in custom Camp Quinn Wedding baseball tees while the ladies of Phillips Mark Salon took care of Hair & Makeup before getting dressed. Colin waited in the woods near the lake for Kari for the first look and we had so much fun with their portraits in front of cabins, around fire pits, walking through dirt paths and dancing near the lake. The outdoor lakeside ceremony was performed by the bride's brother, Jeremy, and we always love it when someone close to the couple officiates. It really adds such a personal and meaningful edge to a ceremony. The Beermobile backed up to the dining hall to sling craft beer and wine all night (and I do mean all night - these guys brought a cooler down to the firepit for the afterparty)! Camp Cody catered the entire weekend including late night pizza for the afterparty! And Hit Play - Cover Story Entertainment kept everyone dancing the ENTIRE night. I am finally not exaggerating when I say that I will probably have a wedding just like this - maybe even right here at Camp Cody! At the very least, we want to photograph all the Upstate New York, New Jersey, Pennsylvania and New England Summer camp weddings that will have us. Maybe there's an official Summer camp wedding photographer spot that we can apply for? What I'm trying to say is congratulations to Kari & Colin, we love you and your wedding was awesome.